Etat Pur is a new skin care brand that only launched a couple of months ago and I've been reading a lot about them ever since. Another thing that's been going round the beauty blogging community is micellar cleansing water, especially Bioderma's. 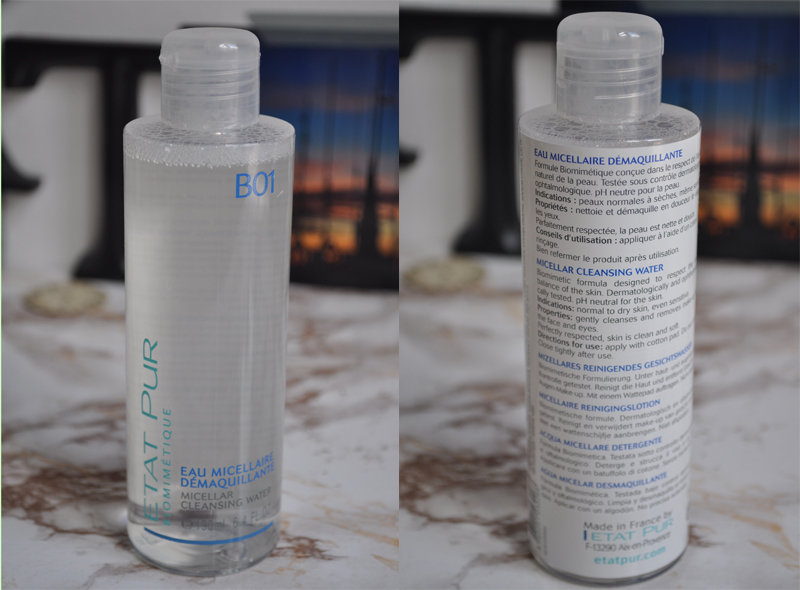 For the past few weeks I've been trying Etat Pur's own Micellar Cleansing Water* to see what all the fuss is about. I haven't tried the Bioderma version yet but it's on my list of things to buy. This cleansing water is suitable for all skin types, even sensitive, but there is a version for those with combination-oily skin. You simply pour some onto a cotton pad and wipe over your face and repeat until the cotton pad comes clean. There's no need to rinse after so you can apply toner and moisturiser straight away. You can also use this to take your eye make-up off which is what I've mainly been using it for. It doesn't sting your eyes or make them cloudy which some eye make-up removers can do and it takes off every scrap of product. I've also been using this as my cleanser in the mornings as properly washing my face can leave it a bit red sometimes. It does have a perfumed scent which smells really nice but I do know some people can react to this. I haven't had any problems with it though and my skin is very sensitive. This has definitely become a part of my everyday skin care routine and can see myself buying bottle after bottle! It has a great price too at £6.40 for 190ml. It's also a lot more accessible than Bioderma for those living in the UK.